Tuckerman Babcock, chairman of the Alaska Republican Party. 2016 photo: Lawrence Ostrovsky. 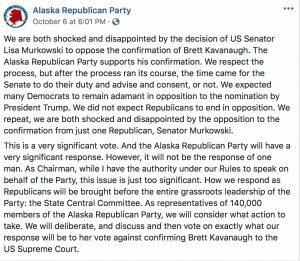 The chairman of the Alaska Republican Party has vowed there will be repercussions for Sen. Lisa Murkowski for opposing the confirmation of U.S. Supreme Court Justice Brett Kavanaugh. 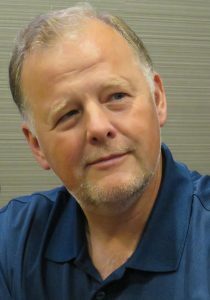 Tuckerman Babcock said in a Facebook post the party will have a “significant response.” He said he’ll leave it to the party’s State Central Committee to decide what action to take against the Republican senator. Murkowski said her opposition was based on what she thought was best for the credibility of the Supreme Court and the country, not on politics. Murkowski is also getting flak from liberals for participating in what’s called a “vote pair” so that Sen. Steve Daines, R-Mont., could go home for his daughter’s wedding in Montana. Murkowski says her vote pair didn’t affect the outcome and was a gesture toward the civility she’d like to see more of in the Senate. “Every little, small baby step that we can take to be more gracious and more generous with one another makes us better senators and better human beings,” she said.